There is an art to omelet making. I learned it long ago at the Café Dewitt in Ithaca, New York, where I had a part-time job as a chef while working on my Masters thesis. The trick is to make the omelet both fluffy and consistent at the same time, airy and yet earthbound. In this particular omelet, the goodness of the eggs is enhanced by the flavor of fresh sage, one of the most sensuous herbs around. I first encountered the culinary use of fresh sage during a trip to the Tuscan countryside, where a small outdoor restaurant hidden away along an ancient road served cheese ravioli in a sauce of melted butter and sage, topped with grated parmesan. It was so fantastic that we went back for more several nights in a row — and since then I have incorporated sage into my French cooking at home. 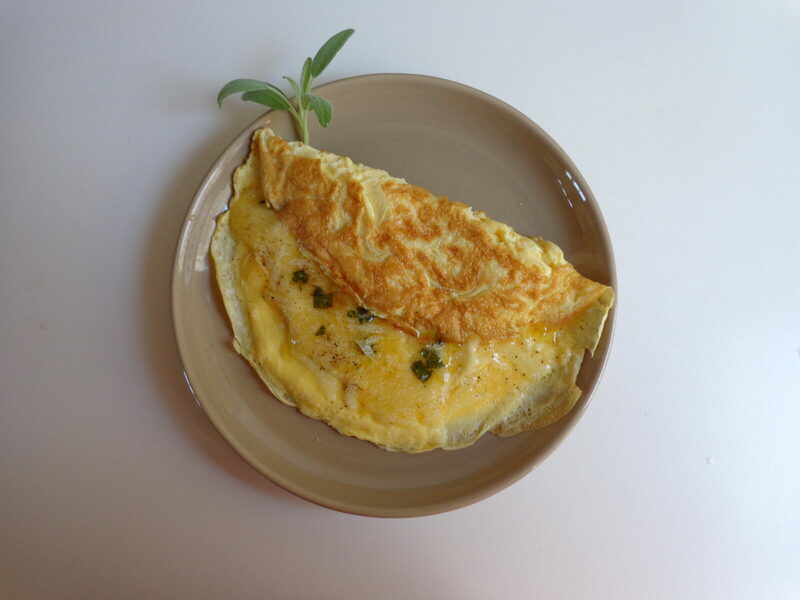 This omelet makes a great lunch dish, accompanied by a green salad, some fresh bread and perhaps a glass of wine. To round out a simple meal, serve fresh fruit for dessert. 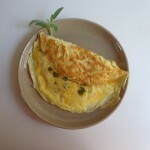 The omelet is quite easy to make once you get hold of the ingredients. If sage isn’t available where you live, you can substitute other herbs, as noted at the bottom of the recipe. This entry was posted in 4. Omelets, Soufflés, Quiche and tagged omelet, omelette, recipe, sage, sauge. Bookmark the permalink.